• What can the Sherpa Power? 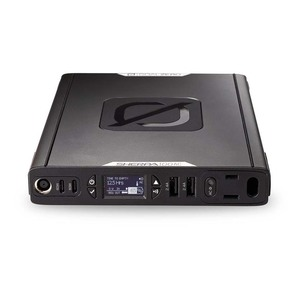 The Sherpa 100AC is great for all your laptops, tablets, or multiple USB powered devices. • Two High-Speed Power Delivery Ports: At 60W each, these USB-C Power Delivery ports provide rapid power for laptops, phones, and more. • Interactive OLED Display: Check power in and power out, get detailed port information, and even set roles for ports. • Four Rugged Cables Included: We’re including the cables you need to get the job done, and an incredibly easy way to store them for later. Includes Lightning, Micro USB, USB-C, and USB-C to USB-C.
Recharge from the sun by connecting a compatible solar panel. Charge time is dependent on the size of the solar panel. The Nomad 28 Plus Solar Panel will fully recharge the Sherpa 100AC in about 7-14 hours. Recharge from a USB source using included cables in 8 - 10 hours. 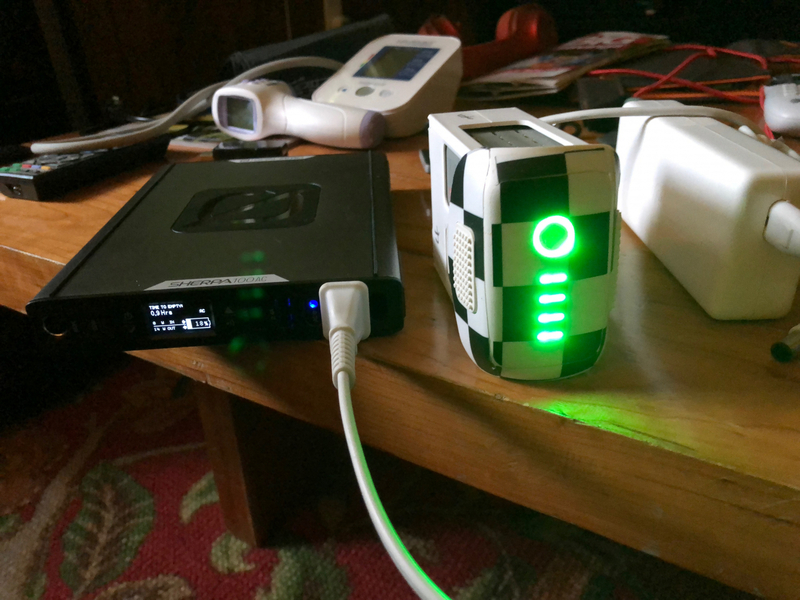 Fully recharges from the wall in about 3 hours using the Sherpa Power Supply (not included). 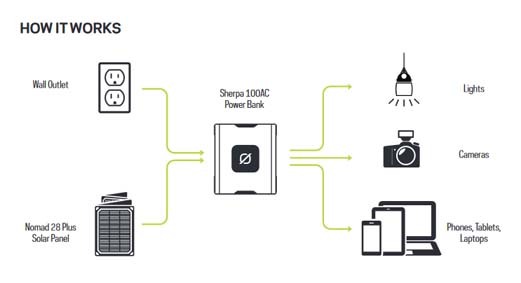 Deliver more power to Sherpa 100AC and Sherpa 100PD Power Banks to reduce recharge times. Compatible with other USB-C devices. Our Black Hole Faraday Bag Non-Window - Large is fantastic for shielding devices from the outside world. Our line of Black Hole Faraday Bags have been designed to aid law enforcement, military, and investigators in the collection, preservation, transport, and analysis of wireless evidence. Now, admittedly an OCD person when it comes to "backups" of every type, I have many different "power banks" and solar panels...Although mostly Goal Zero. My place looks like a Goal Zero showroom. 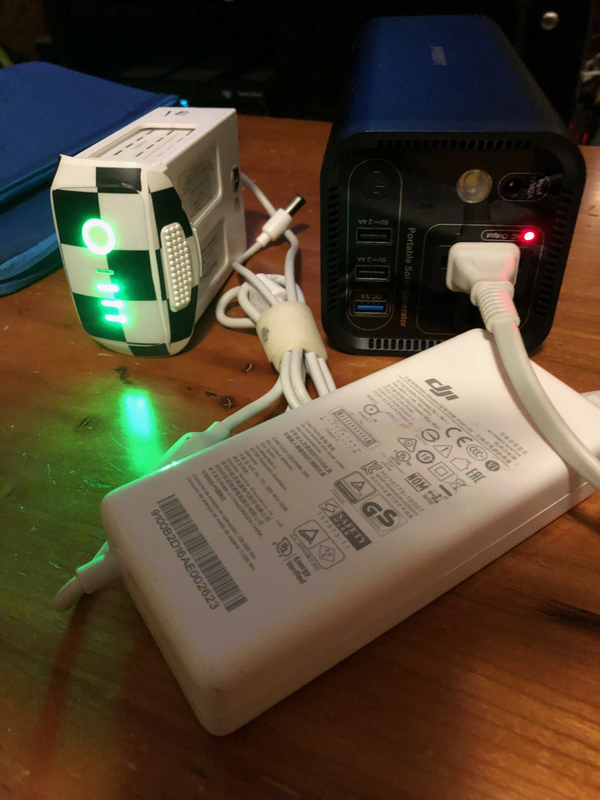 I tested the DJI Phantom 4 Pro drone battery against two other types of, supposedly higher capacity, power banks: The "Suaoki S270 Portable Power Station 150Wh Quiet Gas Free Camping Generator QC3.0 UPS Lithium Power Supply", rated at 150Wh and "max 100W, peak power 150W". After a few minutes of charging the DJI drone battery, the Suaoki Shut down completely. I restarted the S270 and again, after a few minutes, it shut down completely. 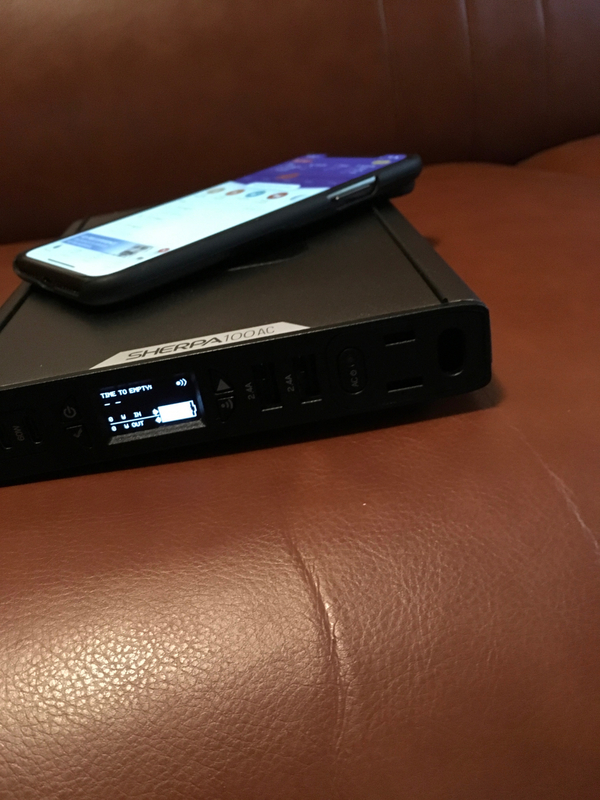 While the S270 has several 12V, USB and 2 110V AC outlets, it does not have a Qi 5W wireless charger like the Sherpa 110AC does, not is it as compact as the Sherpa 110AC or have an informative display like the Sherpa 110AC does. Next, I tested it against a iPrigent "Portable Solar Generator Power Source - 41600mAh 154Wh" which claims to have a 120 Watt inverter output. When I attempted to charger the DJI Phantom 4 Pro battery, it shut down in less than a minute. The iPrigent has a single 110 v output port/receptacle and two USB ports. The input port is a DC 19 volt, 2 Amp socket that charges the unit from an AC-adapter or solar panel. It lacks any "informative display" and simply states it remaining capacity with a series of 4 tiny blue LEDs. Now back to the Goal Zero Sherpa 100AC: It is compact and high quality throughout. For input (recharging it) it has a standard 8mm Goal Zero input receptacle and two Type C connectors, each rated at 60 Watts each. The Type C connector is 2 way so it can be used for input (recharging) and output (charging something else). It can be recharged with a 12v car adapter as well. The Sherpa 100AC has 2 USB ports rated at 2.4 Ams each, and 1 110 volt AC receptacle . 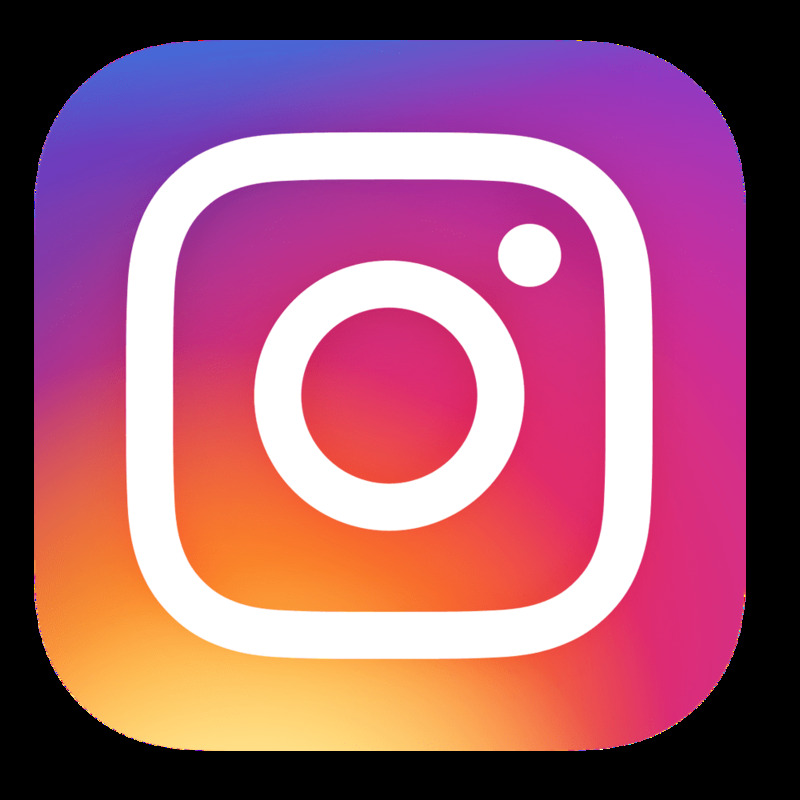 It has a wireless Qi 5 Watt charging pad for phones that have Qi compatible wireless charging, as with the latest iPhones and many Android devices and tablets. I used the Sherpa 100AC to wireless-charge my nearly dead iPhone X, which took between 2 and 3 hours and only consumed 22% of the Sherpa 100AC's capacity. I'm a photographer, using drones, Matterport Systems and conventional still and video equipment. I almost "live" on battery and solar power. The Sherpa 100AC is now my favorite all-around device when I need its capacity. For higher capacity demands I rely on the Goal Zero Yeti 400 Lithium and Yeti 1400 Lithium. In my opinion, the Goal Zero Nomad 28 Plus is the most convenient way to charge the Sherpa 100AC when sun is available. When you want remote or backup power, "usually reliable" is not an option. As a matter of fact, I consider "usually reliable" an oxymoron. I have found this Sherpa 100AC to be "reliable" as in "completely reliable", which is what you want. 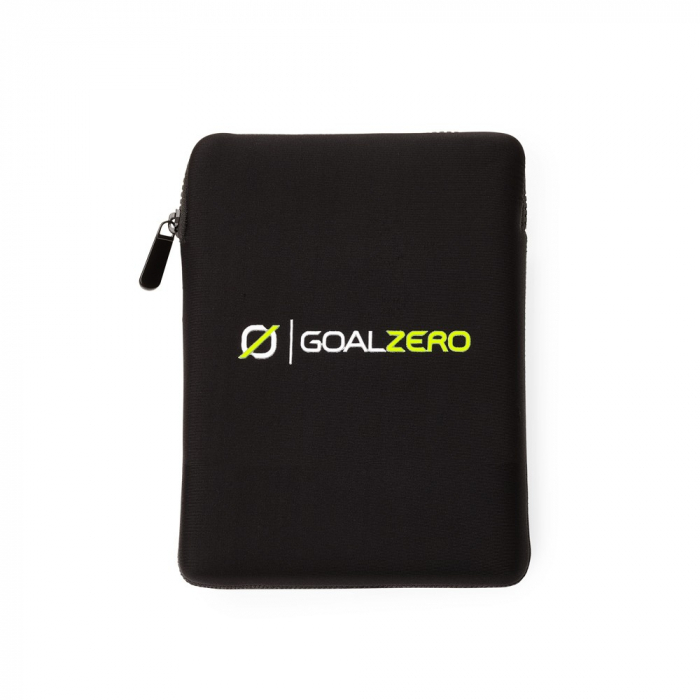 If you're considering a Power Bank of this capacity, look no further and get the Goal Zero Sherpa 100AC. I doubt that you'd have any second-thoughts! This Item is wonderful with the Note 9. I use it daily. Do you have a GOAL ZERO Sherpa 100AC form-fitting sleeve to go with this? We do indeed! We carry this item however it is not listed on the website at the moment. Please contact us directly at 877-548-3387 to purchase this product. Thank you for your inquiry!